Launch by Blancpain of Léon Hatot's rectangular "Rolls", an automatic wristwatch using "roller winding", whereby the movement could move back and forth in the case - a revolutionary idea at that time. Worn by Jacques-Yves Cousteau and his team during the shoot of "The World of Silence" (Palme d'Or at Cannes in 1956), Blancpain's Fifty Fathoms was also selected for its technical superiority by several armies (among others: US, French, German and Italian). Launch of the Ladybird model, the smallest automatic movement in the world. A world first: the smallest movement indicating moon phase , day, month and date. Launch of the smallest minute repeater wristwatch. Two world firsts: the world's slimmest chronograph and the first self-winding split-seconds chronograph in the history of watchmaking. Another world première: the first and only self-winding Tourbillon watch with date and one-week power reserve. Blancpain presents simultaneously all six masterpieces of the watchmaker's art housed in identical cases. And finally, marking watchmaking history, the 1735 including all six masterpieces in a single watchcase - the most complicated wristwatch ever made. To celebrate the 300th birthday of its founder, Jehan-Jacques Blancpain , the company in Le Brassus created the 7001 watch. Launch of the 2100 watch ( Léman collection today) whose screw-locked case back and pushpieces ensure water-resistance to 100 meters, a perfect companion for the ceaseless drive and mobility of the women and men of today. An all-time record year: the watches of the 2100 sports line ( Léman collection today) were named "Watches of the Year" for 1995-96. Blancpain develops the new 100-hour movement for adaptation on all models of the 2100 collection ( Léman collection today) (moon phase, extra-slim, perpetual calendar). Launch of the flyback chronograph . Blancpain is the first brand to bring out a ladies' chronograph with flyback hand. Creation of the new self-winding Ladybird watch, housing a tiny automatic movement - the smallest and the slimmest in the world. Launch of the Sea - Earth - Sky trilogy including the Fifty Fathoms, the GMT and the Air Command. 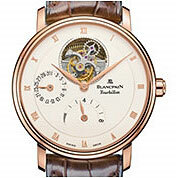 The ladies watch prize of La Revue des Montres was awarded to Blancpain's self-winding flyback chronograph (ref. 2385-1127). The ultra-slim , Villeret , self-winding was recognised "Watch of the Year" by the Swiss public.